Brodie’s was founded by James and Lizzie Brodie in the summer of 2008 after they took over the abandoned Sweet William Brewery in Leyton and they brew a mixture of traditional English style bitters alongside some hyper hopped brews that take inspiration from our American friends across the pond. 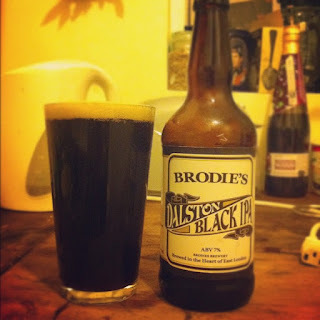 When I was in the Mason & Taylor a couple of weeks ago I tried my first Brodies Beer, Hackney Red IPA and was thoroughly impressed so along with the Kernel IPA Citra I reviewed last week I took home a bottle of their Dalston Black IPA as I am a big fan of this relatively new genre. Unlike a lot of the craft breweries whose beer I really enjoy Brodies beers are bottle conditioned and go through another period of fermentation before they are consumed. The majority of beers I have enjoyed recently from both sides of the Atlantic have not gone through the bottle conditioning process but have been immensely enjoyable as have the few bottle conditioned beers such as this one but as I’m not a brewer myself I don’t understand the advantages or disadvantages of creating the beer in this way. I think this goes a long way to prove that regardless of how the beer is created or served if it tastes good and drinkers are happy then brewers should have free license to brew their beer as they see fit and call it what they want. I’m having a lot of luck with beer recently, thanks to social networking and some fantastic, fanatical writing by my fellow bloggers I’ve not found much wrong with any of the beers I’ve tried lately. I’m now excited that there are so many beers from breweries such as Kernel and Brodies that I’ve really got my work cut out for me, in fact the London brewing scene is looking very healthy indeed! Thank you Brodies for joining in the serious arse kicking that the UK ale scene needs, East London is suddenly starting to look a whole lot more inviting. I love discovering a new beer that totally blows my mind, especially when the brewery is located within the same city as I am. 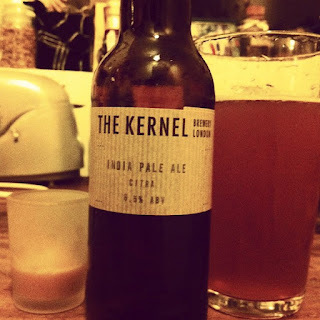 Despite loads of people gushing about their beer until last week I had never had the opportunity to sample a brew from The Kernel Brewery who are located near Tower Bridge in South London but after a wonderful debut visit to the Mason & Taylor I finally picked up one of their bottles to take home with me. The beer is their incredibly popular India Pale Ale and this one has been hopped with Citra, instead of brewing to strict recipes The Kernel use what ingredients they have available at the time and so their menu is constantly evolving and their brewers adapting and it is a method I highly respect. As a drinker I am quite excited at the prospect of trying this beer again in the future but seeing how it has changed based on the ingredients used at the time so I will definitely seeking out more beers from this brewery as the year progresses. Hype can be a terrible thing as it can result in a terrible anticlimax as it has done to me so many times before. Being such a huge fan of hoppy IPA’s and reading all the praise that the Kernel have so far received I assumed that this beer was going to be the best thing since sliced artisan bread but was worried that I was perhaps a little too excited and if the beer turned out to be ordinary then I would surely be bitterly disappointed. Before heading to work last Friday I decided to place the beer in the fridge before I left the house and as the day progressed the hype began to build, slowly at first but as the clock approached closing time I could barely contain myself. When I finally got home the first thing I wanted to do was rip the top off and start smashing it down but DISASTER, I’d stored the beer on its side and failed to realise that this was a bottle conditioned beer and that the brewers yeast within needed to settle. Thankfully after standing upright for ten minutes the little yeast dudes had sank back to the bottom of the bottle and I carefully poured the hazy amber contents into a glass. After pouring I swilled the remaining liquid and yeast around the bottle and emptied it into a shot glass, see I was told by the nice folks at the Mason & Taylor that yeast, in small quantities, is very good for your skin and nails however I wasn’t tempted then and I wasn’t tempted now, I think I’ll just stick with the beer. Before I move on to my tasting notes I’d like to mention how fantastic I think the labels used by The Kernel are. Proof if was needed that less is more, the smart modern logo on a simple brown background are used for every beer with the contents and the ABV simply printed on after the bottle has been filled. The Kernel are open every Saturday from 9am to 3pm and you can buy beer directly from the brewery, sadly I run a shop and my Saturdays involve doing selling of my own but perhaps I shall have to take a day off at some point to go and check the brewery out and tell you good people all about it. Right, back to the beer, is it going to live up to this mountainous hype that I’ve created for it? The lovely pale copper liquid is hazy and has most likely seen very little filtering, if indeed any in order to preserve the lofty flavours of those Citra hops. The aroma literally leaps out of the glass but instead of punching you in the face it embraces you with a warm and welcoming sleeper hold luring you in and politely requesting you take a large gulp. Who am I to refuse such an offer and diving in I immediately get a huge rush of citrus fruit with a few notes of tropical fruit just about present underneath. The beer feels fantastically funky in the mouth with loads of substance and a hint of fine carbonation to help unlock all of those complex lemon and grapefruit flavours. IPA Citra is both smooth and zingy and has the perfect amount of malt to give the hops a solid backbone without ever bordering on being too sweet. The beer is tart and refreshing and leaves a lovely lingering bitter finish with each mouthful practically begging you to take another sip. Sadly I gave in to those begging cries and the beer lasted me all of around fifteen minutes but that was time enough for me to repeat the word ‘wow’ out loud several times and fall head over heels in love. This IPA ranks as not only one of the best beers in its class but surely one of the best beers available right now and I thoroughly recommend trying any IPA from Kernel regardless of the hop content because if it’s half as good as this then it will still blow your mind. This is the best beer I’ve had so far this year, and I’ve already had quite a few. Like many of you fellow UK based craft beer fans out there I order the majority of my beer online. This concept baffles many of my friends, ‘why order online when you can just wander into a shop and pick up some beers on the way home’ they often ask me. I’ll tell you exactly why I do this; like many other craft beer enthusiasts/geeks/maniacs, call us what you will, I am constantly seeking out new flavours, new experiences and trying as hard as I can to discover the best that the brewing industry has to offer be it micro or macro brewed. The beer geek scene has wholly embraced Twitter and this makes it so easy to connect with fellow bloggers, drinkers and brewers themselves and rarely a week goes by when I don’t hear about another range of beers that I want to get my teeth into. This happened just the other week when I discovered the fantastic Summer Wine Brewery who are based up in Yorkshire (yet another incredible Yorkshire micro brewery, where are they all coming from!?) and have a range of beers that speak to my personal palate. I couldn’t wait to place my first order from their super easy to use website and see if their beer lives up to the high praise I’ve witnessed. I received my beer a couple of days ago, it was kindly left on my doorstep by my local courier and ordinarily in most situations this would be fine but I happen to live in London and I’m very surprised that it was left there at all and that it wasn’t stolen. If it had been stolen I would have been livid, mainly because I had been waiting almost two weeks for this case after the first one was damaged by the courier and didn’t report it back to the good folks at Summer Wine. When I chased it up the brewery couldn’t have been more brilliant in the way that they handled it and I got my replacement case exactly when they said it would arrive. The unfortunate thing is that out of the last six online beer orders I’ve placed FOUR of them have been lost or damaged and not been reported back to the supplier by the courier. I assume that my local depot is staffed solely by heavy handed yet light fingered folks, I hope that if they did steal my beer that they hated it, couldn’t understand the sucker punch of hops and went back to their can of *insert brand name here*. I’ve got nothing against mass produced beers by the way, they just aren’t for me anymore. The breweries and suppliers are not to blame here, I work for a company that runs a mail order department and try as we might we cannot find one courier that is better than the others, yes there are some downright terrible ones like Yodel but there is very little to differentiate the rest of them, they are all a bit smashy. The only real solution is surely to stop ordering online and just make do with what I can buy locally or swing by a Central London craft beer bar to pick some bottles up there. As much as I do occasionally buy from Jacks, my nearest decent off license, I can’t get my fix of something like Odell IPA from them and the problem with heading to somewhere like The Euston Tap, CASK or the Mason & Taylor is that because they have premises to run that the prices are not as keen as the online dealers. For the record, I have actually bought some great beers from those aformentioned bars, sometimes it's worth paying extra for excellence. So despite my moaning I will continue to order from places such as mybrewerytap.com and Ales by Mail because the service is great and the selection is outstanding. The real solution is more long term, with more craft beer bars acquiring a license to sell alcohol for consumption off the premises the market will surely become more competitive and perhaps prices will improve as a little competition is introduced. However I think if we look to our friends across the pond in the USA we can perhaps see what the future holds for the craft beer industry in the UK but I fear we are still several years behind them. American Liquor ‘Supermarkets’ are something to behold, they are epic shrines to the consumption of booze and the joy of drink. They are the size of a large Tesco extra and are not only crammed to the gills with a brilliant selection of both local, national and international beers but are also full of artisan wines and craft spirits as well as plenty of the big brands to keep business ticking over, there is literally something for every drinker. As well as being able to get a great selection from the ‘offy’ craft beer bars and brewery tap rooms in the US often sell ‘growlers’ four pint flasks which can be brought back and refilled for much less than it costs for a six pack. The UK has nothing like this and with companies like Threshers disappearing and Oddbins falling into administration this would indicate that these companies are doing it wrong. In a typical liquor store in the states you’ll probably find at least 40 or 50 brands of beer including every brewing style you can probably think of with perhaps the most suprising thing being the selection of British brews available. The US loves the UK as it’s what inspired their incredible passion for beer and it’s surprisingly easy to find yourself something by Fullers or Sam Smiths to name just two… Even smaller breweries such as Brewdog are finding success internationally, their hop forward brews being a hit not just in the States but worldwide. If one clever chain of off licenses decided to start treating beer with the same regard it treats wine and whiskey then surely they will see massive growth and success, companies like Oddbins or Nicolas would be ideal places for craft beer fans to get their fix. Sadly they seem to only stock brands such as Stella and Peroni and if you’re lucky maybe a mass produced ale or two, surely I’m not the only person thinking that the UK needs to wake up and smell the business opportunity? Incidentally I’ll be reviewing the Summer Wine mixed case in its entirety over the next couple of weeks! Last Wednesday something I thought was really cool happened, the twitterverse got it’s act together and shared simultaneously their first taste of Durham Brewery White Stout to a seemingly unanimous verdict that it was, in fact, the elixir of the very gods themselves. Now me being me I got pretty jealous of all these people gushing about this beer because I didn’t have any in, having already decided that I’d probably spent a little too much money on new beers online in the last couple of weeks plus I was out at the time, honing my forward defensive during some pre season cricket training. As I was making my way home on the underground I flicked through twitter and read what felt like several hundred tweets about #whitestout and was working up quite a green-eyed thirst. So when I got home I decided that seeing as I’d missed out on this historic event I would treat myself to something extra special and as luck would have it I had shelled out twelve of my pounds on a bottle of Thornbridge Bracia only a couple of weeks beforehand. I’ll be the first to admit that I was loathe to spend this much money on one bottle of beer but I had only read high praise for it and thought that it would be nice to keep for an occasion when I felt like patting myself on the back. As I’d been smacking cricket balls with timing and precision earlier it was definitely time for a backslapping session. Handily, Bracia has some advice as to what temperature the beer should be served at (around 10 degrees Celsius) so I removed it from the fridge and let it warm up a little prior to cracking the top. Before I poured the beer I took some time to read the label; described as a rich, dark ale Bracia has a seemingly endless list of malts and hops that have gone into the manufacture of this beer. As if that wasn’t enough it’s also been infused with chestnut honey from Italy and aged in port barrels for three months before bottling, I was certainly starting to realize why this beer commands such a high price and yet disappears from bottle shop shelves so quickly. The good folk at Thornbridge see fit to brew this beer four times a year so if you can’t find any you can be quietly confident that it will probably be available again in the not too distant future. Although I usually order my beer online I picked this one up from Jack’s Off License in Finsbury Park, a hidden gem of a booze dealer I plan to blog about in the future. Selecting my large Chimay branded snifter I carefully poured the beer into the glass, what came out of the bottle was one of the thickest beers I have ever seen. The velveteen liquid oozed out of the bottle filling my glass with a very dark brown syrup and as it slowly settled a thin yet tight mocha brown head formed atop the liqueur like substance. The aroma was incredibly powerful with notes of oak, espresso and sherry wafting around and wrapped up with an incredibly strong hit of alcohol. The beer is incredibly thick and the flavours are some of the most powerful I’ve ever experienced, the first thought the flavour gives is one of molasses followed by a hint of dry tawny port, this is then neatly balanced with a big hit of freshly roasted coffee and upon swallowing I definitely detected hints of bitter lemon zest. Then it hits you, a massive wave of warming booze creeping up your throat almost as if it’s even more alcoholic than it’s 10% ABV would suggest. I took plenty of time to reflect on Bracia. Being so strong and thick and as I was keeping all 500 millilitres to myself I took plenty of time devouring this beer and as it warmed some flavours softened but the hop character developed and became a lot stronger. Bracia has one hell of a lot of hops as diverse in variety as Target and Sorachi Ace so it seems only natural that these hops develop as your palate begins to understand and interpret the multitude of flavours this beer offers. The bottle I drank was pretty fresh and although I didn't purchase a second I can imagine that this is one beer that would develop a different character if it was cellared for around 6 months. Many high strength beers, particularly double or imperial IPA’s seem to try and hide the high ABV with masses of malt and hops and although there is no doubt Bracia contains huge amounts of both the alcohol is kept in plain sight and really dominates this beer. Not that this is a bad thing, in fact it would be a great beer to recommend to wine or spirit drinkers because of it’s almost liqueur like quality plus it has bags more going on than an average bottle of wine that would cost the same amount. 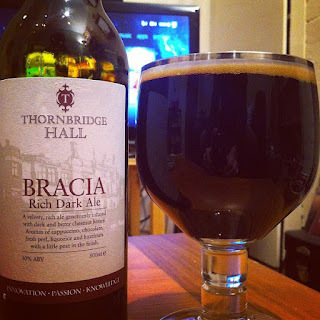 Bracia is quite simply a fantastic and very special beer, I was kept entranced and enthralled while enjoying the whole bottle over about an hour and a half. Is it worth it’s hefty price tag? I would definitely say so, it’s the kind of beer you bring out to impress at a dinner party with some very strong cheeses, in fact it’s so thick I’d probably skip the pudding and pour some of this into a bowl and serve it to my guests with a spoon, scoop of ice cream optional. 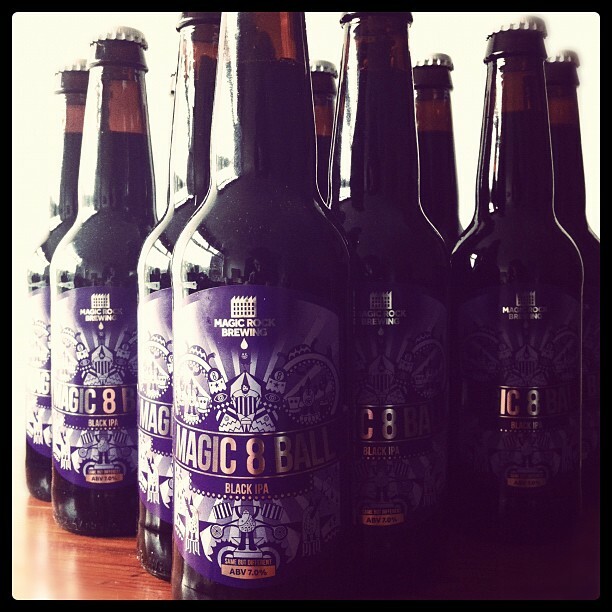 The beer I’ll be sampling today will be the brewery’s new black IPA Magic 8 Ball which has already received rave reviews from other beer writers and as I have been blown away by every black IPA I’ve tried so far I cannot wait to wrap my tongue around this one. I also really love a good oxymoron and ‘black IPA’ is simply wonderful, I’ve read articles that condemn the identity that this style of brew has claimed but I think it is a perfect way of describing to the drinker what to expect from the beer and I am really glad that most brewers have adopted this label.